PAN Card is required to fill ITR, bank and many other places. The process of applying online for a new PAN card is quite simple. If the PAN card is lost or the names and other information on the PAN card are to be updated, then what process you have to follow, we will give you this information today. By following the online process we have told you today, you can repaint or easily update the PAN card. After the application is processed, your PAN card will be printed and sent to your address. Today we will tell you the steps to update the PAN card. So let's start by first name. 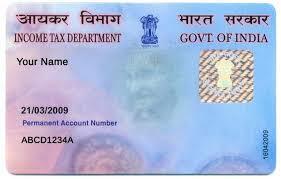 There may be several reasons for renaming in the PAN card (change in name after marriage or other reason). It may also be that the name on the PAN card has been printed incorrectly. We will tell you how to update names through Aadhaar eKYC. If your name is correct in the Aadhaar card then follow the steps mentioned below. If the name is not correct even on the basis, then you have to submit another document. If you wish, you can submit a marriage certificate or other authentic documents such as passport and so on. To update the PAN card, the same documents are needed which are needed when creating a new PAN card. You will need documents for ID proof, address proof and date of birth. Driving License, Aadhar Card etc. in ID proof. Address proof electricity bill, water bill, voter ID card. Birth certificates, birth certificates, matriculation certificates etc. are required for documents. 1) Go to NSDL or UTITSL website to reprint or update PAN card. We went to the NSDL site and after this we followed all these steps. 2) First go to the application type, then click Change or Correction in existing PAN Data / Reprint of PAN Card. After filling the requested information, submit the CAPTCHA code. 3) After that you have to choose how you want to submit documents for PAN. If you want, you can submit the documents through e-KYC, but this will require Aadhaar Card. You can submit a scan photo via e-sign or send it to the document. We submit documents through e-KYC. Wherever you see the red (*) sign, click Next on filling the information. 4) Enter your personal information in place of the red (*) sign. Then click Next. 5) Keep in mind that the information given by you should be provided to existing data on Aadhaar card. If information differs from the information on the Aadhaar card, then you will not be able to complete the process. After payment, it will be seen that both information is not related to each other. If this happens your money will be returned. It is therefore advised to double check the recorded information before clicking on the submit button. 6) Then select the document you want to apply with the application. After clicking on eKYC we filled out the requested information and clicked on Proceed. 7) After doing this, you will see the charge amount. Indian citizens will have to pay 120 rupees to reprint or update. Click Pay Confirm to pay. 8) Enter information for payment details and pay the amount. After this there will be a new page open that will show you that your transaction is successful. After this, you will get bank reference number and transaction number. Save these two and then click Continue. 9) After this the base must be certified. Tick ​​the box under the base card number and then click on Authenticate. 10) If your personal information meets existing information on Aadhaar card, then click on Continue with e-Sign / e-KYC. 11) After tick on the check box, click Generate OTP. 12) After this, add OTP and click submit button. 13) After that a new page will open in front of you in which the application form will appear. Download it in PDF format, you will also receive it via email.